Use our handy Frequently Asked Questions matrix to find answers to questions you may have. Simply click on the question title to reveal the answer. 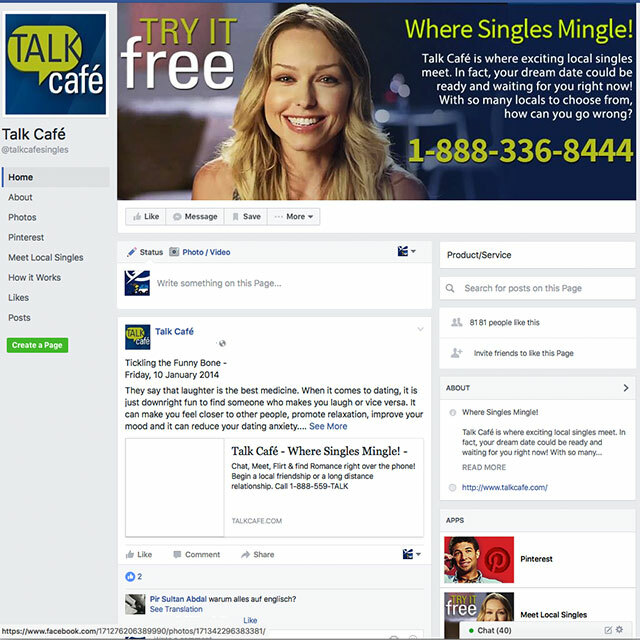 Talk Cafe is a telephone chat service that allows real men and women from all over the country to talk live to one another in the privacy of their own home. Talk Cafe is composed of two areas: Live Talk for live chat, and Voice Personals, which is a mailbox message system. Live Talk is the live portion of the service. Every greeting you hear in that portion of the system is from people who are on the line right now. If you hear a greeting of someone you would like to talk with, press “3″ and send them a connection request. If they choose to accept your connection request you will be connected to that person and be able to have a private, one on one conversation with them. How do I use Live Talk? Live Talk is very easy to use. You record your first name and a greeting and then listen to the greetings of the other callers live on the system. When you hear someone that interests you, send a connection request to talk live. Voice Personal is a mailbox system where you can record a personal message and browse messages to find others with similar interests. This will give you the opportunity to receive messages from people who may be interested in you but are not on the line when you are. Can I give out my phone number and other personal information? Exercise caution and good judgment when sharing more than your basic information with someone. You cannot leave your phone number in a greeting or message. You can only give out your personal information and phone number when you have connected with someone and are talking live to them. Can I meet singles for dates? You can arrange a meeting if you both feel comfortable in doing so. How do I meet locals? Once you record your name and greeting, the first messages you’ll hear on Live Talk will always be singles from your area. If there is no one local in your area at the time you call, you can check the Voice Personals section of the system, which is a mailbox option. These are greetings of people who aren’t necessarily on the system right then, but they will get the message you leave when they check them.